A week ago, I was doing a routine site inspection at my current project assignment - Doha International Airport Departure Hall Expansion - when my celfone rang that musical ringtone. It was my boss - I wondered for a moment what could he possibly want from me this time. He asked me if I was busy and when could I drop by his office. He said he wanted me to take pictures of some of the company's construction sites. So I told him I was busy at the moment but would be able to see him after lunch time. I suspected that he wanted something special out of the pictures. 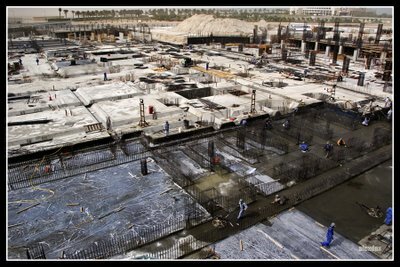 Each construction project normally keeps weekly progress records including progress photographs. He could just simply ask for a copy of those from the respective project managers. But anyway, it was an opportunity for me to do something I love to do so I did not complained. This will be a hotel when completed. I took the shot from the rooftop of a villa and used a wide-angle lens to include as much of the site in the frame. Showing the vast area that this project covers effectively illustrates "construction at a grand scale." When I did met with him at around 2:00 p.m. that day, he gave me a briefing of the task at hand. 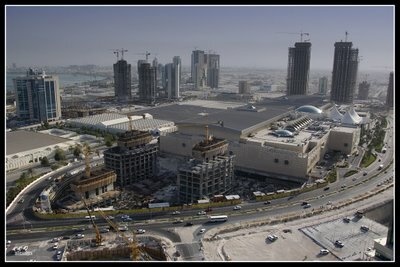 Apparently, our company's Middle East Operating Center Manager (OCM - he oversees the company's Qatar, Dubai, Abu Dhabi, Kuwait and Cairo offices) will be travelling next week to visit our corporate headquarters in Sydney, Australia and he wants to do a presentation of our ongoing projects here in Doha. The purpose is to show the current status of the projects but more importantly, he wants to show that we provide consultancy and construction supervision services at grand scales. Of course, the Directors know what kind of projects we do here but he wants to show, visually, how big they are. His objective is to impress the directors, show that the Middle East is a highly profitable market and gain more of their support so that they may allow us for more budget to sustain our operations and eventually be able to hire more qualified professionals to work for us. Of course, the photos will also be used for something else like company brochures, annual reports, newsletter, website and capability reports to name a few. But the presentation is their more immediate purpose. "So shoot as many as you can. ", he told me. Construction as far as the eyes can see. That is the message I am trying to relay in this picture - that the Middle East is a highly profitable market. The requirements are pictures that would show the overall conditions on site, the company staff while doing their work on site and some interior shots for those that are nearly completed. My boss then proceeded with giving some suggestions on how I might approach the photoshoots. I remember doing a personal construction photoshoot late last year and posting them in flickr and so, using his office internet access, I showed him that set and asked him if those are the kind of pictures the OCM might be looking for. I felt proud of my set when I saw that look of amazement in my boss's face. He was stunned and really loved my work. He said, "Outstanding! Yes, these are the kind of pictures I want you to produce. Go ahead - you have absolute creative control to interpret the pictures." He then gave me a list of the job sites to visit including the contact person in each. There are, in all 15 construction sites at various stages on the list. All of them to be photographed in three days (the remaining days for post-processing works, the OCM's review and selection and preparation of Powerpoint presentation). A rather tight schedule. This photo shows a diverse range of people working for the company. 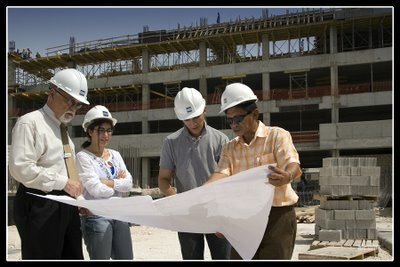 A well seasoned Project Manager, a veteran engineer, a female professional and a younger engineer on the job. Nevertheless, I was thrilled at the realization of what I was given a chance to do here - it's an opportunity to enter the realm of Corporate Photography. So what exactly is a corporate photographer? The corporate photographer takes pictures to illustrate a story about a company's products and performance and to sell a specific corporate image to shareholders and customers. The corporate shooter should not be confused with the industrial photographer, who is usually responsible for producing photos for in-house uses such as newsletters, presentations, and engineering documentations. The corporate shooter works in a specialty that sometimes resembles advertising and sometimes editorial photography. Like the editorial photographer, the corporate shooter goes to a site and shoots whatever is there as creatively as possible. The subject is predetermined by the client, but the photographer has considerable freedom to interpret it. In contrast, the advertising photographer must work under the close supervision of an art director and produce images that are precisely determined before shooting begins. Corporate photography comes closest to advertising when the photos to be produced are of the client's customers (or staff) using the company's products in real life situations. Although using models for a shoot is always an option, for this shoot, actual company staff of engineers and professionals posed while on the job. Like I said, the schedule I was given was tight - 5 sites a day. I would have preferred doing 2 sites per day at the most - one in the morning and another one in the afternoon. That would have given me more time to explore every angle and possibilities. But a tight schedule is part of the corporate photographer's job. 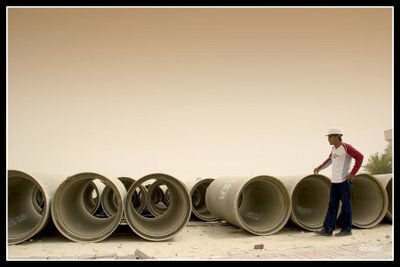 In a drainage project, other than excavation works, there are only these GRP drain pipes to work with. Photographing them with the engineer wearing a safety hat gave some meaning to the picture. Very exciting, Alex! I wish you well! Pat, I wish I could hang out with you guys and shoot those lovely models too, hahaha.
" What's not to like? Travel, creative freedom..."
I'll be interested in how you bump up against photojournalism here. Creative freedom may not include documenting, say, a case of corporate pollution, would it? I suppose if you kept it all positive and let them do the editing (of course, no choice) you can submit whatever you want. How and in what context they use it is another matter. Sorry be so cynical, I really do think this is a great opportunity and some of the finiest photographers on earth have done a lot of work in the corporate world: annual reports, and the like. You're on the path man. Richard, I don't bump up against photojournalism here because that was not what I was paid to do. My hourly rate and the hours I spent are fixed and I get paid whether they use all or just one of the pictures I submitted. Like I said in the blog, the subject is predetermined by the client and I got a briefing of what message the pictures should convey. I had to work with those guidelines but how I interpret them is my call. Possibly for A Week . . .